These identification cards do not have a photograph on them as they once did. Driver’s licenses or ID cards from the Bureau of Motor Vehicles now have photos on them. This card and a photo driver’s license (or BMV ID card) is proof of identity and hearing loss. Proof on file of inclusion in another program such as the Telecommunications Equipment Program (TEP) from the Disability Rights Maine-Deaf Services (DRM), the 70% discount form used by TTY callers for their home TTYs, or the Hearing Loss Placard Program from the Division for the Deaf, Hard of Hearing & Late Deafened. 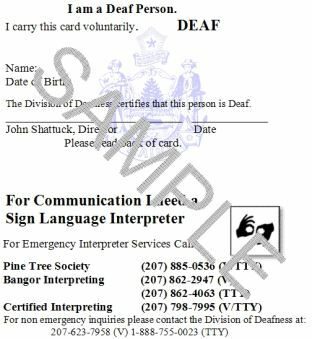 Division for the Deaf, Hard of Hearing & Late Deafened 150 State House Station Augusta, Maine 04333-0150 (207)-470-7668 VP, (207)-623-7998 TTY, (207)-623-7958 Voice, (207)-287-5292 FAX. After completing the application, mail it or fax it to the Division for the Deaf, Hard of Hearing & Late Deafened at the address or fax number given above.